One of my friends has a dozen or so growing in various parts of her yard. She got cuttings from a friend of hers after she noticed the plant was a magnet for butterflies. The bees I can do without, but I rather like butterflies, and if I can plant something that helps them (and hummingbirds) to live longer, I’m in. So my friend recently snipped off two of her plants and told me to stick them in the ground in a sunny spot. She said I might need to water them now and again. And I might want to feed them once in awhile, too. They won’t look pretty over the winter, she told me, but they’ll perk back up next spring. In case you can’t tell from the photo, each plant has smooth, almost waxy, leaves and stands 8-12 inches tall. My friend said they produce masses of tiny pinkish, purple flowers during spring and summer. They don’t have much of a fragrance, and Dallas doesn’t give two hoots for them. I’ve Googled until the Internet Watchdogs likely have me pegged as the Crazy Writer-Lady looking for “novel” ways to do somebody in via a flowering plant! Anyway, my friend called this a Butterfly Plant, but my searches led me to see it as a Kalanchoe (kal-un-KOH-ee). Maybe it’s actually something else. I’m certainly open to suggestions. When I was in Texas, I had a friend who grew the reddish variety of what she called Kalanchoe, and they were lovely most of the year. Another friend here grew them, too, until they became so prolific that she had to thin them out. I’m tired of being ignorant. Help me, please? This entry was posted in Seasonal and tagged butterfly plant, Kalanchoe, plant identification. Bookmark the permalink. You have my sympathy. I managed a two-day escape to east Texas, to the piney woods, and I came across a shrub with berries I’d never seen. Finally, over at a native plant center in town someone told me what it is, and of course now I can find upwards of a thousand photos of it onilne. I don’t have a clue about this one. It doesn’t look like any kalanchoe I’ve ever seen, but that doesn’t mean it isn’t. My suggestion would be to take a photo of it and one leaf and one of those little flowers to a good plant nursery — not a box store. If it’s one that’s been developed for the garden trade, they’ll know what it is. If it’s a native, do an online search for the nearest native plant society chapter, and send them an email. I’ve had great luck doing that. I’d add a link to your society, but I’m out in the woods with this crazy ipad and not much of an internet connection, so I’m just happy if I can get this comment through. Linda, you’ve helped more than you know! I took my photo of this plant to a local nursery (just before they close for the season) and described it pretty much the way I did here. She wasn’t convinced it was Kalanchoe. When I told her my friend assured me it’s a perennial, the lightbulb went off. Goos luck on the search. I totally understand the frustration when you find something like this and can’t pinpoint exactly what it is. I have a flower app on my phone that allows me to snap a pic and then have the app search for what it is. It has been successful part of the time but not always. I can see that it might be a kind of kalanchoe but not the ordinary kind. I will stay tuned to see what the “experts” out there tell you. I suspect a flower app would help, Beth Ann, but it was just as good heeding Linda’s advice to take a photo to one of our local nurseries. She didn’t know at first what it might be, but the more I talked about it and described it, the surer she became that it’s something called Sedum. I’d never heard of that before, but it’s a succulent and seems ideal for so many reasons (https://www.americanmeadows.com/perennials/sedum/how-to-grow-sedum). Thanks for weighing in — I appreciate it! Oh sedum! That makes perfect sense and has so many varieties!!! Oh, you’re familiar with that? Cool! I’m just thrilled at not being “ignorant” anymore, ha! Nor mine, John. However, we’ve finally solved the mystery. It’s a Sedum. It’s supposed to be able to withstand our harsh Illinois winters. If it does, I’ll be interested to see if it really attracts butterflies and hummingbirds next spring! Debbie, I so wish I could help you on identifying this plant/flower, but I am the absolute worst at knowing anything about horticulture. I have a black thumb when it comes to keeping plants or flower, because I kill everything. I even kill silks HA! But judging from the link you shared on Kalanchoe, that’s exactly what it resembles. It’s such a beautiful plant! Ron, the friend who gave me these cuttings is just like you — she says she can’t seem to grow a thing, yet these were simply beautiful (meaning, I suppose, they’re that easy to tend!!). The plant lady at one of our nurseries identified it as Sedum, a relative of Kalanchoe. 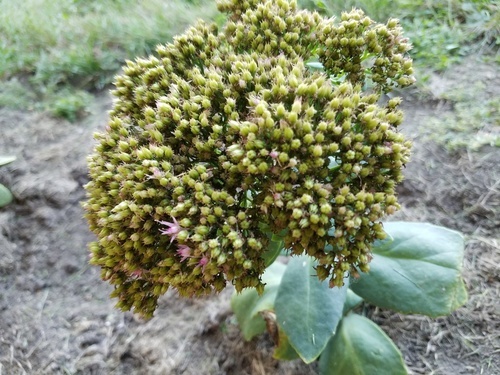 I think this (https://gardeningwithcharlie.com/grow-sedum.html) is what they’re supposed to look like when they’re in bloom. I’m looking forward to seeing if mine will thrive after being transplanted.